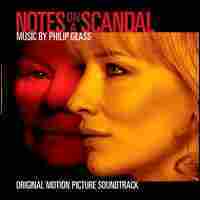 Oscar-Nominated Scores: 'Notes On a Scandal' NPR's movie-music expert Andy Trudeau does a roundup of this year's five Oscar-nominated scores and profiles one more composer: Philip Glass for Notes on a Scandal. Our coverage of the awards includes interviews, analysis and a contest for NPR.org readers. Five composers will compete for film music's biggest prize at Sunday night's 79th annual Academy Awards. NPR's movie-music expert Andy Trudeau has been listening carefully to all of the nominees for Best Original Score. He takes Liane Hansen through the last of this year's list of five: Notes on a Scandal, with music composed by Philip Glass. Known for his minimalist style in Oscar-nominated soundtracks for Kundun and The Hours, Glass shifted gears for this project, Trudeau says. A film about an art teacher who has an affair with a student and the sinister secret that is shared between friends, Notes on a Scandal allows this score to reach moments of crescendo. Glass varies the music by contrasting fast notes played by low strings with longer notes for higher strings and then complements each with a shifting bass line. The result is a soundtrack brimming with melodic writing and a moody oboe theme. Gustavo Santaolalla, Babel: On this seemingly-improvised score, it's hard to tell where the director's soundtrack ends and the composer's contribution begins. Alexandre Desplat, The Queen: A score with many levels manages the movie's transitions between pomp and lightheartedness. Thomas Newman, The Good German: An adventurous spirit creates something both old and new, leaving the listener with much more than a pastiche of golden age scores. Javier Navarette, Pan's Labyrinth: A rich, intimate score walks the delicate line between fantasy and horror.